There is so much happening in the next lunar month I almost don’t know where to begin. This lunar month, which initiates the Winter season, is full of story, is deep with dream, is rich with transformative possibility. When there is so much energy, there is a danger of being overwhelmed. And the danger in being overwhelmed is that we aren’t able to make the most of these possibilities. So, I recommend finding your most centered place this month, setting intention for what you most desire, and meeting the flowing energy with wonder and agility. Summing up Sagittarian lessons. The chart for December’s New Moon shows Jupiter conjunct Pluto in the final degrees of Sagittarius. Jupiter infuses the things it touches with optimism and potency. Pluto challenges through the intensity of shadow and transformation. Because Jupiter is well-placed here in Sagittarius, it is possible now to choose a life-affirming conclusion to Pluto’s transit through Sagittarius. Pluto entered Sagittarius in 1995. During this time, we have seen the shadows inherent in religious fundamentalism (a Sagittarian theme). Pluto’s transit has revealed how we need to understand the impact of our truths on the world. The stories we believe, the stories we tell about the world, create the world. As astrologer Caroline Casey often reminds us, we have choice: What story do you wish to animate? What reality do you wish to create? The exact conjunction of Jupiter and Pluto happens on December 11 at 28 degrees Sagittarius. Both of these planets are on their way out of this sign. Jupiter has been in Sagittarius for one year, Pluto since 1995. The last conjunction of these two planets happened December 1994 at 28 degrees Scorpio. From Sagittarius to Capricorn. One important theme this month is the ingress of several planets into 0 degrees Capricorn. The Winter Solstice occurs when the Sun reaches this degree. Winter is the quietest time, the darkest time, the stillest time of the year. Solstice means Sun standstill. The Sun stands still now and at the other mirror time – the Summer Solstice— for about three days. It doesn’t seem to change its position in the sky relative to the horizon for about three days. On the solstices, the Sun reaches the edges of its course through the heavens. In Summer, its highest and brightest edge and in Winter, its lowest and dimmest edge. In the Winter, this standstill seems more profound. The ear is cocked, the eyes are focused inward or out on the far horizon, the body settles into the dark and waits for illumination. It is a time for divination, a time for communion with Mystery, it is a time to begin again as the light ever so slowly to returns to us. At the crossroads. Winter is also a time of choices made for survival. This is perhaps one of the most important things to remember as we consider the transits that are happening at 0 degrees Capricorn this lunar month and next year. Uranian astrologers call zero degrees of all the Cardinal signs (Aries, Cancer, Libra, and Capricorn) the World Axis degrees. When transits happen at these degrees, we can expect realignment along the axis of reality. This axis can be imagined as a cross, with the Aries/Libra arms stretching out horizontally – symbolizing the opposites of self and others. The Capricorn/Cancer axis is vertical reaching from the foundations of inner realities into the broad heavens of cultural values. When one arm of this axis is activated, all these areas are also activated. This Winter begins the year-long transit of Pluto at zero degrees Capricorn. (exact on January 25, 2008 for the first time) As we have noticed in Sagittarius, Pluto will reveal shadow and present us with the choice of transforming that shadow into life-renewing power. December 18 Jupiter enters Capricorn for one year. December 20 Mercury enters Capricorn (in itself not a significant event but Mercury adds to the Capricorn energy field). Lunar nodes pointing the way to evolution. December 18, the nodes of the Moon shift into new signs. Since June 2006, the north node has transited through Pisces (the south node through Virgo). Since the nodes move backward through the zodiac, the North node will move into Aquarius next. The South node represents karmic lessons to work on. The North node represents the growing edge of evolution. The Pisces/Virgo lessons have been about releasing the details so that we can dream the big dreams. For example, it has not been the time to get bogged down in the details of how we will solve our problems; rather we have been called to believe again in our dreams. From there we will find a way. Now, we let go of some Leo qualities, such as believing that only an extraordinary person could lead us into manifesting our dreams, and grow into realizing that we are together co-creators of the future. The nodes will remain in these signs until August 2009. Mars retrograde journey intensifies. Please see last month’s New Moon forecast for background on Mars retrograde. When a planet turns retrograde, it looks like it is going backward against the background of the stars. The planets that the retrograding planet encounters along this path have special importance to its story. What do you as the hero need to learn from each of these planets? This last Mars transit of this lunar cycle is especially important. Due to its retrograde cycle Mars opposes Pluto three times. (The first time was September 21, 2007 and the final time will be March 7, 2008.) This encounter with Pluto may be the core message from this Mars retrograde journey. When these two planets oppose, there can be confrontation that leads to violence. Certainly, we are able to see our automatic reactions to things that we fear. The choice again, because we do have choice, is whether to let our fears take over our reactions or to let our intentions overcome our fears. The promise of Mars opposing Pluto is greater clarity about our desires and how we intend to manifest them. Lot of energy this month. But this does not need to be a time of anxiety or uncertainty. The gift of Winter for me is the night sky. I live in Minnesota. In Winter, I am able to go outside my warm home and immediately feel the sharp, crisp air on my skin as I look up in wonder. The stars seem closer in Winter. Perhaps they are, and all of their wisdom is perhaps closer as well. I invite you to breathe in the light. This time of year is special. During this lunar month, we experience the thinning of the veil between the worlds at this turning of the year known as Halloween, Samhain, or the cross-quarter holy day of the fixed sign, Scorpio. Without thinking too much about questions like: what are the worlds, what is the veil, how does it thin, what does it mean? I invite you to simply open your senses to this season. What is happening around you? In the Northern Hemisphere, and especially in the far north, in this season the light lessens, darkness ascends. The leaves of the trees finish their summer work of photosynthesis; the sap brings this energy into the roots. We, along with nature, turn within, go down, we remember that there is another place of vast importance—another world. I think of this place as the underworld. This world is the home of my beloved ancestors. This is the veil that thins. These are the worlds we may stand between at Samhain time, at summer’s end. The veil thins and reminds me that there are invisible connections to many worlds that I can reach into at this time. It is a comfort, as I acknowledging death around me, to feel part of this mysterious whole. At this time we are gifted with insight, with guidance from the other worlds. During this lunar cycle, we may turn to the sky as oracle for communion with our deeper selves. The chart for the New Moon shows the beginning pattern for this season of opening and deepening. Mercury stations retrograde at 9 degrees Scorpio on October 11. Mercury, the god of communication and the psychopomp who travels with the dead to their home in the underworld, becomes a strong ally this season. I always recommend honoring Mercury during his retrograde cycle. This month, remaining aware of Mercury’s gifts and challenges to our ways of thinking, communicating, and traveling will be especially important. I expect unusually deep experiences around receiving and sending messages this month. Jupiter squares Uranus exactly (for the third and last time in the current phase of the cycle between these two planets) on October 9. They are still powerfully in exact square on the day of the New Moon. 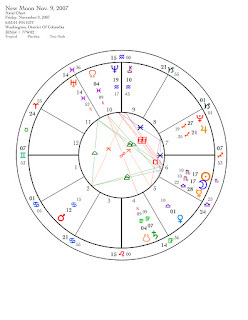 Anyone with planets or points in the birth chart within the span of 13 to 17 degrees of the mutable signs, will feel the tremors of revolution and the urge to change during this lunation. At summer’s end, what needs to change profoundly? What has reached the end of its life? What is the essence that remains after all else falls away? This may be a reckless transit, but sometimes we need unjustified courage to dare to take the next step in our lives. At this time, we will have it. Venus, Saturn and the South Node of the Moon come together in the first few degrees of Virgo at the beginning of this lunar cycle. Beauty, restriction, and karma are three words that summon these archetypes. Saturn promises attainment, Venus promises union, and the South Node promises reconciliation of past errors if we pay attention. Beauty is the guiding energy through possibly difficult situations this month as we continue to grow and evolve in the ways that Saturn and the South Node invite us to. The sign these three archetypes wear like a costume is Virgo. As I wrote in last month’s New Moon forecast, the energy of Virgo is calling to us strongly. Venus’s story. Venus does not particularly enjoy being in Virgo. Under the system of rulerships, Venus is in her fall in this sign. Here is how I explain this condition: Venus’ nature invites pleasure. I imagine her always lying upon a couch and bringing the world to her through the allure of Beauty. Venus enjoys the signs, Taurus, Libra, and Pisces most. Virgo, not so much. I imagine that the diligence and work ethic of Virgo feels uncomfortable to the goddess of pleasure. The terrain of Virgo is tricky for Venus, but not impossible. I also imagine that Venus invites us to the table that can only be set by Virgo and that she challenges us to enjoy the work, the service, the humility, the wholeness that is exemplified by this sign. Venus’s challenge to us is to find that balance point between duty and enjoyment. One could call it the challenge of Joyful Obligation. This season of Samhain is colored by Venus’ challenge and blessing this month. This month Venus will aspect every planet (not the Sun, however) in the solar system, including Chiron. She is busy inviting all the archetypes to the table. Note: the Full Moon on October 25 carries this energy of grace (Venus) needing to balance with authenticity (Uranus). Note: these two transits on October 29 signal the thinning of the veil. Neptune and Jupiter in sextile to each other increases the intuitive skills of divination. Venus in Virgo will speak to us of the need for beauty, harmony, wholeness — service, work, and devotional practice. Note: Pluto is the lord of the underworld. Venus’ last transit with the planets this month is with Pluto. Venus enters Libra, a sign she rules on November 8 at the end of the current lunar cycle. How does Beauty lead me? How does Beauty challenge me? What is the reconciliation and attainment that I seek? What guidance am I receiving from the ancestors? What guidance am I receiving from the starry allies? How do I make sacred this moment? In 2001, I traveled to Greece on a tour led by Demetra George and Vicki Noble. My two favorite subjects, astrology and goddess worship, were the theme of this trip. One outstanding highlight was when the group of twenty or so women stripped off our clothes and jumped into the bay at Perachora, the site of a temple dedicated to Hera. We were enacting an ancient rite—renewing our virginity as Hera was said to do every year before her remarriage to Zeus. It was exhilarating. This New Moon reminds me of that experience. The New Moon this month is in the sign of Virgo, the Virgin. This happens once a year, but this year’s Virgo Moon has more Virgo verve. Saturn has changed everything. After spending two years in Leo, Saturn is now in Virgo. Saturn is so important that even smaller transits like the Moon in Virgo become more noticeable. I get excited by Saturn, not because this planet signals more work, which it does, but because it promises more rewards if I do the work. So, I have been thinking about what my Virgo work may be. That’s when I remembered the swim at Perachora. What a wacky idea — renewing virginity. This may be one of the more wonderful and whimsical things about Virgo, a sign that is often thought of as uptight and prone to perfectionism. I’d like to reclaim Virgo’s allure as well as renew her virginity during Saturn’s transit. This sign promises qualities that we need right now; attention to whole systems; integration of body, mind and spirit; “right relation” with the earth; and personal practices of service, devotion, and healing. This New Moon is also a Solar Eclipse. The symbolism gets richer. With an eclipse the light disappears and returns. I think of eclipses as a reboot of a computer with more uncertainty about what may pop up on the screen when the power comes back. Eclipses are times when we are placed upon new paths by unexpected events. Old things can pass away quickly to be replaced with something new. Like virginity, what we think may be lost forever, gets a new life. The questions I offer for myself and my readers for this New Moon and Eclipse is: What does virginity mean to you? What will you renew this month, this season, and during this two and a half-year Saturn transit? The constellation of Virgo shows a woman carrying a stalk of wheat. The seed head of that stalk is the bright and lovely star – Spica. This woman could be a goddess or a priestess, and she carries the best of the harvest. If you could bring back to the world the best of your harvest, what would it be? Are you willing to serve that vision as a dedicant? Mars retrograde. Mars will not be stationing retrograde this month but Mars does enter the shadow period of that retrograde journey, which begins November 15. The shadow period constitutes the degrees that Mars will retrograde back through before stationing direct and moving forward past the previous place it stationed retrograde. Mythically, I think of Mars retrograde as the hero’s journey. He has to travel back to retrieve something and then must return from that journey with his new-gained treasure. This entire Mars journey (the initial shadow period) begins on September 16 (Mars at 24 degrees Gemini) and lasts till April 4, 2008 (Mars 12 degrees Cancer). One theme for this hero’s journey may be to retrieve what is missing: a Gemini theme. The goal is in Gemini where Mars will station direct in order to return. The place Mars turns retrograde is in Cancer. What does the heart (Cancer theme) tell the hero that starts him on his journey? The beginning of this transit on September 16 will be subtle but pay attention to any urges to complete a missing piece of information, a truth or insight that will require a new point of view. What is missing for you? This storyline intensifies on these days. Jupiter/Uranus story. This lunar month the final square between Jupiter and Uranus will perfect. Jupiter is traveling through the sign it rules and has potent information to share with us about Sagittarius. Sagittarius and Jupiter themes include belief, justice, truth, and what is learned form the point of view of other cultures. Uranian themes include freedom, authenticity, revolution, and awakening. From dreaming to doing, Uranus asks how can we be more authentic. We are in the process of fighting the old stories about religion and cultures that no longer work for the world. I sense that the revolution is one of worldview. The mutable stories predominate the mythical airwaves this month asking us to synthesize, integrate and open to change. May we all find our waters of renewal. I find inspiration in the constancy of the Moon. She shows us the way to renewal. A new possibility is born at each New Moon. This month’s New Moon occurs in Leo. The Leo story has been an important one for the last two years as Saturn has transited through this sign. The spontaneous energy of Leo is one of open-hearted generosity. Saturn’s transit has been to place more weight upon that heart. The investigation has been about our worthiness, our creativity, and our ability to hope. What has the transit of Saturn through Leo taught you? This lunar month is the time to reflect on this because Saturn moves into Virgo on September 2. For those familiar with Tarot, I suggest meditating on the Strength card of your Tarot deck. This card corresponds to the sign Leo. At the time of the New Moon, Venus and Saturn are exactly conjunct (for the second time as Venus is moving through her retrograde cycle). This pairing provides more support for returning to the lessons of these past two years. We can not forget that these past two years have also given us the opposition of Neptune and Saturn—a very important transition for all of us. In the chart for the New Moon, Jupiter is still at its stationary degree conjunct the fixed star, Antares. Please see the previous blog entry for more about this alignment. Mars is applying to an opposition to Jupiter, which will bring a heightening of this Jupiter/Antares energy. The opposition occurs on August 23. On August 24 and 25, Mercury joins in this transit by squaring both Jupiter and Mars. What we might expect at this time: release, intense transition, purging, needing to express emotion. Whenever this type of energy is present, there is also opportunity for healing. The week before the Mars/Jupiter opposition, five Sun transits happen. The time from the New Moon till August 21 may feel energetic, optimistic, and illuminating. Lunar Eclipse at the Full Moon of August 28. For anyone with planets or important points at 3 to 5 degrees of the mutable signs, this eclipse will affect you the most. For everyone, lunar months with eclipses are usually more intense, feel more significant. The light goes out and comes back with an eclipse. What dreams or ideals (Pisces) are losing their sparkle? What is newly illuminated in your life? The Sun opposes Uranus on September 9 near the end of the lunar month, bringing the possibility of illumination to our dreams for authenticity and freedom. The next New Moon on September 11 will be a solar eclipse at 18 Virgo. More on that next month. Blessings of the New Moon to you. During this Balsamic phase of the Moon—the final waning days of this lunar cycle—I find it important to reflect on what has happened this month in my world. I live in Minneapolis, Minnesota on the Mississippi River, less than five miles from the site of the interstate highway bridge collapse that occurred on August 1. I did not know anyone who was on the bridge, and still, it has affected everyone I know who lives here. Just like the concrete dust that filled the air as the bridge fell into the river, an unsettled energy rose up over the city. This was not something that was supposed to happen. At first, I noticed sadness and fear. I think there was an immediate desire to grieve inspite of not being directly involved or knowing anyone who was. Then I noticed a pervasive anxiety, not really related to fear of bridges. I felt more vulnerable. I am a pagan. At the a community ritual celebrating Lughnasad, right after the bridge collapse, the participants who gathered felt a need to release and ground the unsettled energy and we sent out our prayers for those who were suffering from this event. Connection to my community and opportunity to say these prayers in a sacred space helped me to feel more settled within myself. All of this gave me a new awareness of what it must be like to live in a war zone, where things that are not supposed to happen, happen all the time. Where death and disruption cause huge tears in the fabric of energy. From this experience, turn to the questions: What am I learning? What does it mean? I turn to the stories in the stars. Here are some contributing factors, clues to meaning. 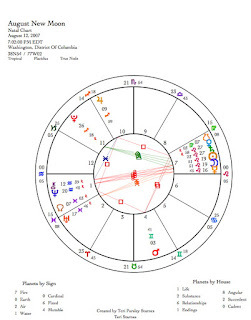 Many astrologers in the blogosphere have commented on the chart for the bridge collapse. It is quite dramatic with Pluto exactly conjunct the Ascendant and the apex of a YOD (Finger of God) formation with Mars and Mercury. Mars was also exactly square to Saturn, a transit that I noted in my new moon entry for July 14th. And the Moon was conjunct Uranus. I don’t believe these transits caused this collapse, I do believe that they significantly influenced the reaction that many of us had to this tragedy. This event is something important. Something to pay careful attention to. There is a message. Pluto is commanding our attention. There is something deep and vital to pay attention to. Soon, Pluto will station direct during the next lunar month, and begin moving through the last remaining degrees of Sagittarius. I have noticed other news stories about America’s crumbling infrastructure lately. It is good to recognize the fears that come up around this and the choices we make based on those fears. If the fears that arise under a Pluto transit are not dealt with consciously, then we will have to live with the consequences of our unconscious fear-based choices. This theme will become even more important as Pluto truly does enter Capricorn in 2008. Mars and Mercury are part of this YOD, increasing the tension and the stakes for getting this right. Mercury may represent the pace of life we are creating. Mars brings the tipping point. Something collapses. In the week before the collapse, Mars in Taurus squared Neptune and then Saturn, activating the opposition between Saturn and Neptune. Part of the general anxiety I feel from this configuration is not knowing what to believe, how bad it really is, and whether we will really be able to do anything positive to prevent this or something worse from happening again. In other words, Pluto’s fears tinged with Saturn/Neptune’s despair. I believe in our power to effect positive change in the world. I believe that we are capable of true wisdom, compassion and love. And the tone of these times, with these transits, is challenging my beliefs in these things. This is a rite of passage. I hope these dark times lead to new strengths and new authentic wisdom. Last night, I noticed a final piece that seems significant. My husband and I were driving home from downtown. I had not actually seen the ruins of the bridge until then. The glaring spotlights were helping the divers who worked into the evening as they finally were able to retrieve some of the victims’ bodies from the river. There is another energy that comes from that site. Deep admiration and gratitude for those who were there doing that recovery work. As we drove past, I looked up into the sky, high overhead was Jupiter stationed exactly over Antares, the red star of the constellation, Scorpio. On August 6th, Jupiter stationed direct next to this star. This is one of the four royal stars of Persia. Fixed star lore (from Bernadette Brady’s Book of Fixed Stars) says that Antares is “Linked with obsession; intense and probing.” …“To the Persians, this star was the god of the dead.”…“The natural desire of this star [is] to generate success by going through a cleansing life-and-death experience. “ In the bridge collapse chart, Jupiter was trine the Sun exactly and was closely squared the Moon’s nodes. Is there a cleansing to be had from this life-and-death experience? I tread lightly. Whatever experience I have had during this time is minor compared to those who were on the bridge or those who had loved ones on the bridge, or the many who responded to the emergency. I offer my prayers up that true healing will come. That cleansing and wisdom will come. That we will be more connected to each other in the ways that matter. That we will treat each other more gently in a world were the ordinary can shift into the tragic in just a flash. 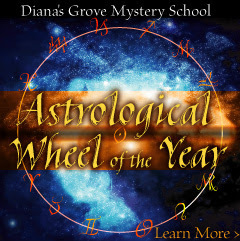 Hello, I just got back from a week between the worlds teaching astrology at Diana's Grove and saw that I failed to give the correct date for Venus retrograde in my last post about the New Moon that occurred on July 14. I’m sorry about that. The actual date for Venus stationing retrograde is July 27. At that time Venus will be at 2 degrees Virgo, with the Sun at 4 degrees Leo. We will still be able to see Venus as the Evening Star on this date as there is more than 30 degrees separating the Sun and Venus. One week later, there will be 22 degrees separating the Sun and Venus therefore Venus will be closer to the horizon at sunset. By the end of the next week, there will only be 12 degrees separating these two. Venus will be much more difficult to pinpoint in the glare of the Sun. Sometime in the week of Aug. 12, Venus will disappear as the Evening Star. Say goodbye! From the Great Above she opened her ear to the Great Below. From the Great Above the goddess opened her ear to the Great Below. From the Great Above Inanna opened her ear to the Great Below. As Venus turns toward the Sun, I ask: What is calling me into the depths? From the sign Virgo, I hear a call. Perhaps the journey will initiate from a desire to find healing for mind and body. Perhaps it comes from a longing for the order that brings wholeness. Perhaps the call of service leads us into our depths. Venus passes a portal going from Virgo back into Leo. The journey may become one of finding that missing piece of the self, the true gift that I bring to the world. On August 17, Venus and the Sun come into conjunction at 24 degrees Leo. What illuminates the depth of you? What beauty can you bring back with you? My Lady looks in sweet wonder from heaven. The people of Sumer parade before the holy Inanna. Inanna, the Lady of the Morning, is radiant. I sing your praises, holy Inanna. The lady of the Morning is radiant on the horizon. What radiance do you bring back into this world? Venus stations direct on September 8 at 16 degrees Leo. Venus returns to 2 degrees Virgo on October 10 when her journey finally resolves. In wonder, we can see her shining from the pre-dawn sky. Hello. I’m dashing off some New Moon thoughts tonight as I get ready to leave town tomorrow (July 6). I will be spending a week in one of the most beautiful and magical places that I have ever visited: Diana’s Grove in Missouri. I will be one of three teachers presenting astrology at a week-long women’s retreat: Lunacy. For more information about the Grove and their Mystery School, visit their website: www.dianasgrove.com. I hope readers have had a chance to see the conjunction of Venus and Saturn that has been gracing the night sky these past few weeks. It perfected on July 1. However, when the waxing crescent Moon joins these two on July 16th, I think the sight will be even more beautiful. Venusian transits were highlights of the last lunar month. Mars takes his turn this month. The New Moon chart shows Mars square Chiron. Then on July 24 Mars will square Neptune and on July 31 Mars will square Saturn. Mars, the warrior, is in the Fixed Earth sign, Taurus. The Chiron square brings to mind the ways we will need to heal our relationship to the earth. Right on the heels of that transit, the Neptune square may bring a challenge around using our dreams to move us forward toward that healing. Then the hero visits Saturn, a final word with the Wise One: No more illusions, no more blame, how will you create lasting change? On July 2, Venus will turn retrograde at the beginning of Virgo, another sign that encourages stewarding the earth. She then quickly moves back into Leo where she will again transit Saturn and Neptune next lunar month. These “minor” planets, Mars and Venus are working us to do something about our disillusionment. I believe they will encourage us to re-enchant the world. Will you fall in love again with beauty? Will you dare to take action on your hopes? Jupiter will reach the end of his retrograde motion on August 6. Traveling through Sagittarius, the sign of the Archer. Jupiter moving backwards has been pulling back the arrow. Now, as he turns direct, where will you let that arrow fly? Where is the sign Sagittarius is your chart? Imagine sending an arrow of amazing possibility into that house of your chart. Mutable energy of last month. How did you move with that energy? (see New Moon of May 16) If you have Mutable signs* in your chart, perhaps it felt familiar and comfortable, however if planets or points in your chart are located between 15 to 19 degrees of Mutable signs or near 28 degrees of a Mutable sign (the Pluto degree), then this past month may have been more challenging for you. If you have few or no planets and points in the Mutable signs then you may have experienced this “all over the place” energy as uncomfortable. This month the Fixed and Cardinal signs become emphasized as we experience the last exact opposition of Neptune and Saturn in the Fixed signs of Aquarius and Leo and as the Sun enters Cancer (a Cardinal sign) at the Summer Solstice. The next lunar cycle includes important transitions. At this time, Mercury is stationary and rules the sign of this lunation (Gemini) – This is the Trickster month. Summer Solstice on June 21. We collectively tune to the energy of what we need to do to take care of things. The Cardinal sign of Cancer is often associated with nurturing, but nurturing can take many forms. As a Cardinal sign, Cancer takes initiative and is concerned about ensuring that needs are met, whether that be the need for food, a hug, or the need to take charge of any situation that demands it. The chart for the Solstice is dominated by the near exact opposition of Neptune and Saturn occurring on June 25. Consider what you have been experiencing and learning during the time of these planets opposing each other (see below). How will you take care of this situation? June 25 the final exact opposition of Saturn and Neptune at 22 degrees Leo/Aquarius occurs. The opposition between these two planets, beginning to be felt in 2005, became active the first time these two planets exactly opposed each other in August 2006 (17 degrees Aquarius/Leo) right before the election that gave Congress to the Democratic Party. The second opposition occurred in February 2007 (20 degrees Aquarius/Leo) when the debate about the non-binding resolution to end the war in Iraq was beginning and Al Gore’s documentary about global warming, “An Inconvenient Truth,” won an Academy Award. What will this third transit bring? Reflect on how your dreams and your belief of what is possible have been changed over this past year. Were there times when you needed to make adjustments between these two extremes? Have some dreams died? Have you found a way to solidify other dreams? Has something transformed? Is there still grief? Are you still hanging on to a dream that is truly over? During this last transit imagine that you are ready move on. Claim the new possibilities that your heart desires. When we lose faith in our dreams, it can be hard to trust again. What do you need to build that trust? How do you want to reinvigorate your dreams in a more realistic way? What wants to welcome you? Can you let go of hardship and believe in your dreams again? 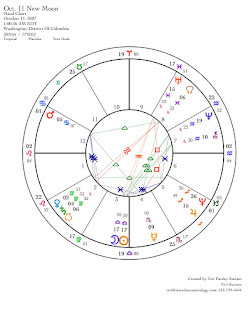 The chart of this New Moon shows a lot of support for realizing the lessons of the Saturn/Neptune opposition. Mars sextiles Neptune, trines Saturn, and sextiles the Moon and Sun. Sextiles and trines point to encouragement and flow, but we need to consciously engage this energy or it will simply flow past us. Since the New Moon occurs in an air sign, Neptune is in an air sign, and Saturn and Mars are in fire signs, the key to anchoring the opportunity of this new moon may be in the elements of earth and water. Can you take the ideas (air) and the passion (fire) of your dreams and goals and find ways to plant them firmly in the here and now (earth) and let them move you toward compassion (water)? A spell is a symbolic act to create a change in consciousness. What is one impossible dream that you desire to give your heart to? In the next lunar month, especially during the waxing phase, take one small action. Actions create and are aligned with the element of earth. If you can make that action a daily practice, even better. To honor and include water, give a past grief that you are holding in your heart to a moving body of water. Only through our disappointments can we learn to make our dreams real. The Full Moon in Capricorn on June 30 will be a perfect time to release this spell into the world. Invoke the Magician and Trickster this month to honor Mercury retrograde. This archetype reminds us that we cannot possibly plan for every contingency. It is also necessary to be flexible and open to the unexpected. Since Mercury retrogrades through Cancer, we may need to be flexible about those situations that we feel we need to take care of. There will be a dance between the desire to control and the need to let go. Have a great and inspiring month! These energies can be thought of as stages of manifestation and evolution. The Cardinal energy sets intention. Fixed energy manifests. Mutable energy shifts the experience into meaning. For example, in meditation practice, one sets intention for the practice, then does the practice, and finally the practice is dedicated to a higher purpose. This formula can be followed while the Sun transits the Cardinal, Fixed, and Mutable signs. During the Cardinal month, notice your intentions for the season. During the Fixed month, what is happening? During the Mutable month, what is the meaning or purpose? The New Moon occurs at the end of the Fixed sign, Taurus (26 degrees) on May 16. But the energy of this lunar cycle will feel very mutable, especially when the Sun moves into Gemini on May 21. The important mutable stories of the moment are being expressed by Jupiter and Pluto in Sagittarius and Uranus in Pisces. The major transits of this lunar month involve these three planets. As the Mutable signs search for meaning and shift and change forms, it is good to be flexible. It is also good to let go of personal attachments, more of a Fixed sign approach. What needs to be surrendered, can be during this month. Attention becomes diffused. Although it may be harder to focus, we will be flooded with new insights. 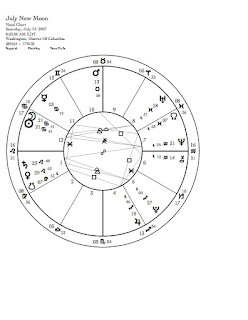 May 20 - Mercury (17 degrees Gemini) opposes Jupiter and squares Uranus. The trickster god activates the dynamic square between Jupiter and Uranus. Sparks may fly, especially mentally. May 21 - Sun enters Gemini — The Mutable Air sign. Thoughts soar with the purpose of finding connection and meaning. May 25 -Venus (18 degrees Cancer) trines Uranus. This harmonious aspect between the goddess of love and the great awakener facilitates authentic expressions of pleasure. May 27 - Mercury (28 degrees Gemini) opposes Pluto. The psychopomp (guide of souls to the Underworld) confronts the lord of the Underworld. This signals a release of what has been hidden into consciousness. May 31 - Full Moon. The Sun (10 degrees Gemini) and Moon (10 degrees Sagittarius) closely square the nodes (North node 11 degrees Pisces, South Node 11 degrees Virgo). This Full Moon may be the culmination of this Mutable energy, and with the nodes involved, karmic events may happen. June 5 - Sun (15 degrees Gemini) opposes Jupiter. Surrender what you know to be true. Invite in expansive optimism. June 9 - Sun (18 degrees Gemini) squares Uranus. Shift the boundaries of what is possible. Awaken to authenticity. The fixed stories involving Saturn, Chiron, and Neptune are a bit quieter this month. May 21- Chiron stations retrograde (16 degrees Aquarius). The wounded healer and shaman turns inward. May 25 - Neptune stations retrograde (22 degrees Aquarius). The planet of transcendence and illusion is strong. June 11 - Mars (20 degrees Aries) trines Saturn (20 degrees Leo). Fire energy is marshaled to achieve our goals. June 13 - Sun (21 degrees Gemini) trines Neptune. Flow of inspiration. And Mars (21 degrees Aries) sextiles Neptune. Take action on these inspirations. Looking back at last lunar cycle. Today, the Moon is waning. It is in that phase astrologers call the Balsamic Phase. this is a good time to reflect on the past lunar month, let the old cycle go to get ready for the next. See New Moon April 17 entry for reference for this post. My practice of astrology is strongly focused on observation. It is one thing to predict energy based on astrological theory and it is another thing to observe what really happens. This past month has been interesting for me because, some things have not unfolded the way I expected them to. Fire. Last month had a lot of fire energy. Astrological theory says that aspects between signs of the same element are harmonious, we should experience this energy as flowing and helpful. So it is interesting to notice how many places are on fire right now, and not in the good way. Fires have been burning in Florida, California, and in my home state, Minnesota where one of the worst forest fires recorded is burning in the Boundary Waters. These are just the fires I know about. I would not be surprised if there were more. This last month we had the second of three trines between Jupiter and Saturn (May 6) both in fire signs. Could it be that fire is working on our behalf to teach us something important? In 2000, Jupiter and Saturn came together forming a conjunction in Taurus, a fixed earth sign. The conjunction of these two planets, happening at 20-year intervals, signals a beginning of an important cultural cycle—the principals of conservation and expansion merging. Responsibility and possibility come together to create a new reality. If we follow the pattern of a lunar cycle, what begins at the New Moon will come to fruition in the Full. We are headed toward the opposition (or Full Phase) of Jupiter and Saturn in 2010 ( Jupiter in Pisces and Saturn in Virgo). The trine happening right now is one stage in the development of the new reality. The reality will be about what is important to Taurus – the Earth, her resources, and our relationship to Beauty. Perhaps the fires are burning away any denial that we have left about our need to take care of the Earth and to do it now. 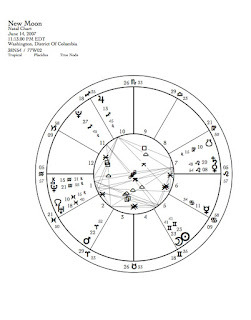 Another surprise for me from last month was the very quiet transit of Mars (May 13) at the Solar Eclipse degree (28 degrees Pisces) of March 18. Perhaps this is the nature of Pisces, a water sign ruled by Neptune – god of the seas. A lot can be going on underneath the surface of that water. And I think this is true. Ever since Uranus entered Pisces in 2003, I’ve expected more of a splash from Pisces. It may not be until the transiting nodes move out of Pisces/Virgo in December, and really until Uranus moves into Aries in 2010, that we “get” what is going on under the waves. I’m still going to be paying attention to my dreams, my intuition, my hopes for the world during this time. A new lunar month begins on May 16. See my next post for more information about the Taurus New Moon. This is the first New Moon of Spring—the Aries New Moon. Ideas that represent Aries—new beginnings, fresh growth, taking the lead, assertion of will— are all possibilities for this lunar cycle. The fire element is strong this season. Aries is fire, Saturn is in Leo and Jupiter and Pluto are in the remaining fire sign, Sagittarius. Fire is energy; it is our ability to know and act instinctively. How do you invoke and honor fire this month? Fire can be your ally of action and passion. Fire can be healing and it can be destructive. The most transformative transits this month will be the transits that trigger the Solar Eclipse of March 18. (See the post for April 13 for more about these transits.) The days around these transits may be more intense. May 11 - Jupiter will again square Uranus exactly this month. (See the post for January 22 for more about the Jupiter/Uranus square.) Ready for change or not ready for change, change is coming. Pisces and Sagittarius are the signs involved. Both of these signs have a spiritual focus, and with Pluto also influencing us from its position in Sagittarius as well, we could expect change to happen in the arena of life that pertains to this sign, such as the justice system, education, religions, philosophies, and foreign places and people. These two planets are not as close to an exact opposition as they have been. They will return to their third and final opposition in June. However, this transit is still very much part of our reality. As Caroline Casey says: “Neptune lays the track for Saturn’s reality train.” Profound shifts are happening to us. Notice how the muscle of dreaming is being developed by challenges from the realm of responsibility. Yeats wrote: “In dreams begin responsibility.” We are finding out right now how to let responsibility become the genesis of dream. Fire is an apt element for this lunar cycle. There is a lot of energy coming our way this month. Breathe into the possibility. Trust the force of your dreams. Continuing to look at the Solar Eclipse of March 18. What are the themes that are we see emerging from this eclipse? The current lunar cycle began on March 18 with a solar eclipse at 28 degrees Pisces. 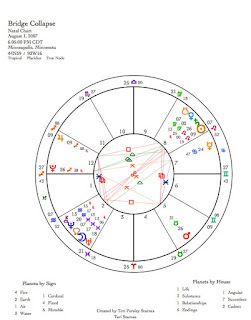 There is a Pluto tone to this eclipse and to this lunar cycle since Pluto at 28 degrees Sagittarius, was exactly squaring the New Moon/Solar Eclipse degree. When Pluto is involved, we can expect to notice more strongly issues and events around power, shadows, deep secrets, death, and rebirth. The energy can feel pretty intense and sometimes karmic as Pluto moves us toward the kind of changes we need to make to be true to our deepest selves. The eclipse degree becomes sensitive to all subsequent transits to it. All transits to 28 degrees Pisces can act as a trigger for this eclipse, but especially 28 degrees of the mutable signs, Pisces, Gemini, Sagittarius and Virgo should be observed. How do we determine what this eclipse means to us personally? If you have any planets or important points in your chart close to 28 degrees of the mutable signs, then this eclipse is important to you. Take notice of what is being transited. For example, if it is Venus, perhaps the eclipse is about how you are being received by others. If it is Mars, perhaps it is about how you get what you want. Notice what is up for you around the dates listed above. Perhaps a pattern of illumination will emerge. We can also ask ourselves, what does this eclipse mean to us collectively? Current events can give clues. I am intrigued by the sudden media storm around Don Imus’ racist remarks about the Rutger’s women’s basketball team. 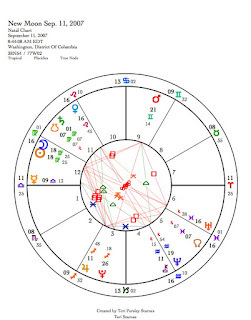 Although this is an event happening to Don Imus personally (and it looks like his chart is being transited by this eclipse), the attention the event has gotten from the media, tells us about ourselves too. Pluto releases secrets or shameful behavior, the collective reaction tells us what we are willing to change. What we no longer tolerate. According to www.who2.com (I can not vouch for the accuracy of this data), Don Imus was born on July 23, 1940 in Riverside, CA. On this date, Venus was located at 27 Gemini, very close to the 28 degrees of this eclipse. The Moon was also in Pisces on that day. It may be playing into the effect of this eclipse on his life as well. Neptune is farther away at 23 degrees Virgo. The next triggering transit to the eclipse will be from Venus on May 7. Most likely other current events will capture our attention. Notice whether someone in the public eye, who represents Venus, will represent a Pluto experience for all us. On May 13, the eclipse will be triggered by Mars. This could be quite a significant transit as Mars can represent war and aggression. But Mars tells us that there are other ways to be passionate too. Will we collectively take a step toward no longer tolerating violent responses to others? The opportunity is there for each of us. People are going back and forth across the doorsill. This New Moon is such a doorway. A doorway where two worlds touch. A doorway with people going back and forth – some moving towards waking, some moving towards sleep. Which will you be? Neptune and Uranus (as well as Saturn) continue to be the theme of the moment. Neptune rules the secrets that the dawn has to tell us. Uranus rules staying awake. This New Moon is particularly powerful because it is a solar eclipse. Whatever intention we’d like to give to this month, we can actually use for at least the next 6 months until the next solar eclipse. Sometimes it is easy to get overwhelmed by portentous times and fail to make any changes at all. Let the ocean of Neptune’s dreams carry us into readiness. We are being prepared to shift our consciousness now (this is a theme of the ongoing Saturn/Neptune opposition this year), whether we intentionally engage with that energy or not. But it is always possible to pay attention more, to decide to not go back to sleep. During this New Moon Uranus is conjunct the North Node of the Moon, that sensitive point which signals where eclipses can happen. Imagine that an ally of staying awake is whispering to you as you go through the door saying, “Don’t go back to sleep, your dreams are possible and even if they aren’t, they are still necessary.” Jupiter, planet of opportunity (and squaring Uranus), stands at the portal too. Jupiter is a portal specialist—the word “portal” and the word “opportunity” come from the same root. There is urgency as well as possibility. Neptune and Saturn continue to oppose each other. The value of this transit is still being decided, but they seem to be saying that two worlds, which at times seem diametrically opposed—that of reality and dreams—are indeed touching at this doorway. Help is on the way! Jupiter is exactly trine Saturn at the New Moon. They are both in fire signs. Fire is the ally of instinct, energy, and renewal, as well as destruction. Mars, in Aquarius, is four degrees away from Neptune. Mars is the knight championing the dream. This can only add more energy and urgency. Venus is the lone earth energy of this moment. Venus stands in the first degrees of Taurus, sign that she rules and the sign of Earth stewardship. Venus is also favorably aspected by Mercury in Pisces. These two seem to say, Let there be beauty and let the beauty flow from our intuition. All the outer planets are involved in this lunation. The New Moon at 28 degrees Pisces is exactly square to Pluto. The stakes are raised when Pluto gets involved. We are entering the last year of Pluto’s transit through Sagittarius (begun in 1995). This Solar Eclipse signals that this next year is a time of synthesizing what this transit has been about, and preparing ourselves for Pluto, the transformer, to enter Capricorn. Vernal Equinox on March 21 (CDT). A pattern for the year is set. Mars opposite Saturn on March 22 (18 degrees Aquarius and 18 degrees Leo). Mercury conjunct Uranus on April 1(16 degrees Pisces) What better symbol for April Fool’s Day? Dare to be dorky and express freedom! Venus squares Saturn and Neptune. Venus mediates the Saturn/Neptune opposition April 2 through April 4. What does the Earth want to tell us? At the New Moon each month, we have the opportunity to reset our rhythms, to let go and begin again, to grab hold of the energy of outward growth and set new intentions. This New Moon occurs in an Air sign, Aquarius. What are you absorbing right now about thought, communication, visions, and ideas? This New Moon is a good time to pay attention to those things. Communication is tricky and heightened at this time also because Mercury (god of communication) is traveling retrograde right now, having stationed retrograde just a few days before on Feb. 13. [Stationed at 10 degrees Pisces]. It will station direct on March 7 at 25 degrees Aquarius, very near the degree of this New Moon. Not until the 27th of March will we be entirely free of this retrograde cycle. What new ways can we find to experience thought and insight? Starting in Pisces and ending in Aquarius, this retrograde will be an opportunity to travel into imagination and feelings to retrieve the visions for community that Aquarius loves. Swinging between the irrational and the rational, this lunar month will be a time to watch for our assumptions about what is true, what was really said, what do our dreams mean, and what might we need to sacrifice for new growth. The second exact opposition [1st - 8/2006, and 3rd - 6/2007] of Saturn [20 degrees Leo] and Neptune [20 degrees Aquarius] occurs this month on February 28. Saturn wants to place a reality check on all the mystical meanderings that Mercury will be up to this month. Neptune will try to make a sense of reality harder and harder to attain. An opposition could be a stalemate betweens dreams and reality or an opportunity to find the sustainable balance between these two necessary forces. For example, take the issue of global warming. Too much Saturn creates a sense of doom and hopelessness to do anything about this. Too much Neptune fails to make real world changes in our behavior. The proper balance might help us to connect to the Mystery of the natural world in order to create new, real-world relationships with all beings. Can you imagine talking to a glacier? Can you imagine taking that conversation into real action? What is the balance that you need to find at this time to go forward in your life? The Full Moon on March 3 will be a Lunar Eclipse at 13 degrees of Pisces/Virgo. The planet of revolution, Uranus, will be conjunct the Sun and the North Node at this time. We are being asked to expand; to dream larger; to revolutionize what is possible. At the end of the lunar month, on March 16, Jupiter [19 degrees Sagittarius] will trine Saturn [19 degrees Leo]. Fire becomes a resource for action and change. Saturn will help us focus passion and Jupiter will lighten the Saturn load. As Winter ends, consider the importance of your dreams and the actions you are joyfully willing to take base on those dreams. The group [worshipping at the temple], which called on the Olympian Zeus (“King of the gods and the mover of things”) to bring peace to the world, ignored a ban by the Culture Ministry, which declared the site off limits to any kind of organized activity to protect the temple. But participants did not try to enter the temple, and no officials sought to stop the ceremony. “We are the Greeks and we demand from the government the right to use our temples, said high priestess Doreta Peppa. And so it begins. What rights do we dare to claim for ourselves under this transit? Be bold! Jupiter, mover of things, is on the scene. Uranus, the darer of things, is joining in. Way to go, Doreta! I wish you success. Let’s call this New Moon: Venus pays a visit to Neptune and Jupiter gets ready to ignite Uranus. The gods are busy. Every New Moon is time to reorient the self. It is the perfect time to set month-long intentions. This New Moon occurs in the grounded earth sign, Capricorn, but it feels like the real action is happening in our dreams. Venus is exactly conjunct dream-lord Neptune today at 18 degrees Aquarius. Venus invites and she is especially inviting Neptune to add his characteristic qualities of transcendence and idealism as well as addiction and illusion to our month. Sometimes a good night’s dream can make all the difference. What are you dreaming about? Well, if any of your dreams involve revolution, change, or authenticity, then Jupiter will probably light a fire under you when Jupiter (12 degrees Sagittarius) squares Uranus (12 degrees Pisces) on January 22. This is the first of the three times that these two planets will square off this year. If you have an emphasis of planets or important points in your chart that occur around 11 to 18 degrees of the mutable signs, you will especially feel the urge to change and create change in your world this year. Perhaps while Venus is visiting Neptune we can ask for a dream to help us through it all.